This great set contains two burnishers, and two colourless blenders, as well as an eraser and pencil sharpener. Use over colour to create an impressive shine. 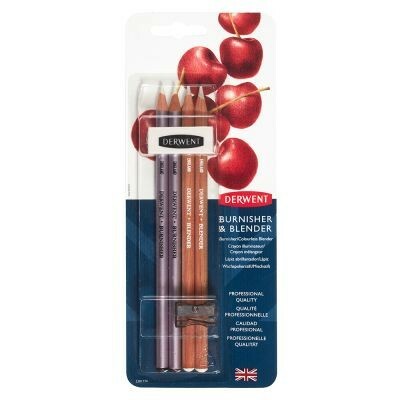 The Derwent Burnisher is a hard colourless pencil which when used over layers of pigment provides a rich polished finish. Burnishing pushes the pigment into the paper and leaves a very well blended, photo like finish. It makes the colours look brighter and can give an image a polished or reflective look by sealing it with a heavy layer of colourless wax.